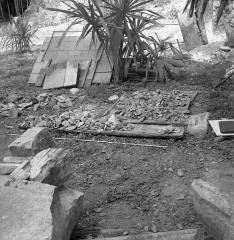 Results 1 - 14 of 14 for "fragment"
Caption: Stela 19 and top and bottom fragments of Altar 6, in situ in Structure 4E-43, spring 1956.
Credit: Linton Satterthwaite, University of Pennsylvania Tikal Project Negative 57-2-11, All rights reserved. University of Pennsylvania Museum. 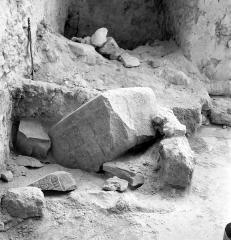 Caption: Stela 26 in Structure 34, rear view from Room 3, from S and W, with monument fragments in position; west wall of enclosing altar removed; 1958. 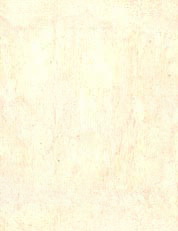 Note other two walls (S and E). 1/2 meter scale in background. 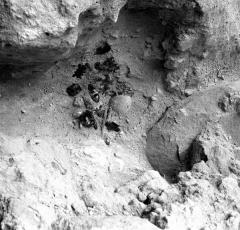 Credit: William R. Coe, University of Pennsylvania Tikal Project Negative 58-4-322, University of Pennsylvania Museum. All rights reserved. 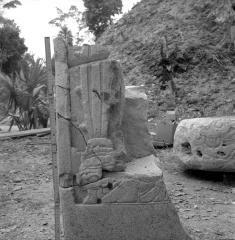 Caption: Stela 6, lower portion, detail shot to show small fragments fitted to top of badly broken stela, 1959.
Credit: William R. Coe, University of Pennsylvania Tikal Project Negative 59-4-974, University of Pennsylvania Museum. All rights reserved. 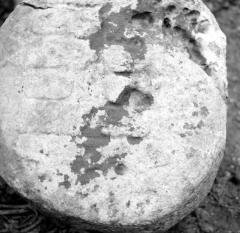 Caption: 19th century metate from carved stela fragment; fits Stela 21; 1962.
Credit: William R. Coe, University of Pennsylvania Tikal Project Negative 62-4-1063, University of Pennsylvania Museum. All rights reserved. 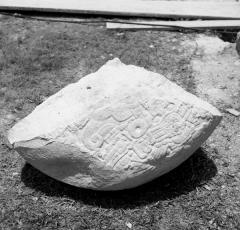 Caption: Uolantun Stela 1, top fragment, back, February 1962.
Credit: Christopher Jones, University of Pennsylvania Tikal Project Negative 62-43-4, All rights reserved. University of Pennsylvania Museum. 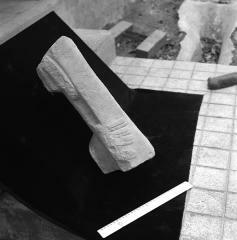 Caption: Altar 19 fragment, April 1963.
Credit: William R. Coe, University of Pennsylvania Tikal Project Negative 63-4-1272, All rights reserved. University of Pennsylvania Museum. 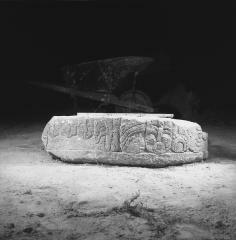 Caption: Altar 2 fragment, side view, night shot, May 1963.
Credit: William R. Coe, University of Pennsylvania Tikal Project Negative 63-4-1478, All rights reserved. University of Pennsylvania Museum. 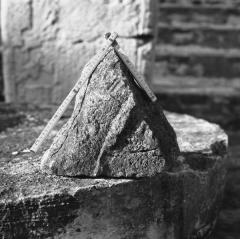 Caption: Altar 11, top fragment, winter 1968.
Credit: William R. Coe, University of Pennsylvania Tikal Project Negative 68-4-612, All rights reserved. University of Pennsylvania Museum. 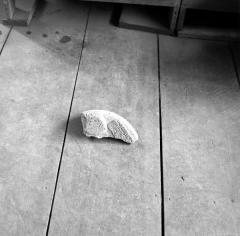 Caption: Largest fragment of Miscellaneous Stone 69, snake head, Object #12R-226. 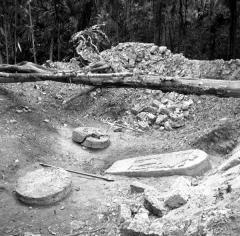 Credit: William R. Coe, University of Pennsylvania Tikal Project Negative C63-4-95, All rights reserved. University of Pennsylvania Museum. 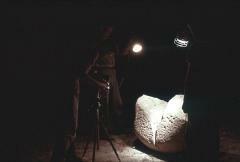 Caption: Walter Newsom and unidentified photographer, photographing Altar 19 fragment, 1963.
Credit: William R. Coe, University of Pennsylvania Tikal Project Negative CX63-4-175, All rights reserved. University of Pennsylvania Museum. 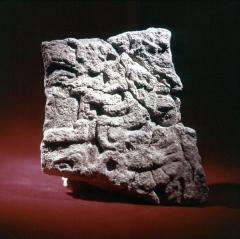 Caption: Cache 14, located in the interior of altar covering the fragments of Stela 26, Structure 5D-34. 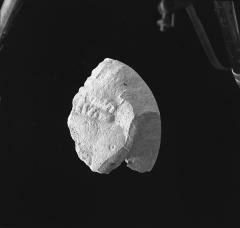 Credit: William R. Coe, University of Pe, University of Pennsylvania Museum. All rights reserved.